The Sierra Madre Tattler! 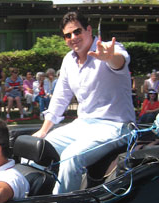 : Did Mayor John Harabedian Give Sierra Madre "The Horns" at the 4th of July Parade? Did Mayor John Harabedian Give Sierra Madre "The Horns" at the 4th of July Parade? Having grown up in the belly of New Jersey, and therefore immersed in a culture that has blessed our world with such classic highbrow entertainment as "Jersey Shore" (link) and "The Guido Guide" (link), I am deeply aware of the phenomenon known as "giving someone the horns." Being of mostly garden variety Celtic descent myself, I was never personally invited to participate in this form of communication. Which is fine, and I did not take that personally. But I have witnessed this kind of thing up close. And yes, I can say "yo." Which is pretty much why this picture of the Mayor of Sierra Madre, torn from the front page of a recent issue of the nearly newsless Looney Views News, jumped right out at me. Because, at least in this picture, it does look like The Mayor is giving somebody "the horns." Or, having now appeared on the front page of our adjudicated weekly paper, perhaps it is nearly everyone in the city that got them. Crowd horning, as it were. Italy is the country where instead of giving someone the traditional finger in the car, you can really insult them by giving them the ‘corne’ or horns. That is the index finger and the pinkie raised to look like horns. If you say in Italian that someone has corne, it means that his or her spouse is cheating. They are being cuckolded. That is the worst possible insult you can give to an Italian man. As tempted as I have been in the past to make use of the gesture against aggressive, obnoxious Italian male drivers, Gustavo warned me that people, who have made that gesture in the past, have been run down and murdered by the insulted driver. I have also provided you with this screen shot from "The Guido Guide" website. It shows how an individual might give someone "the horns." This can seem to be a bit aggressive, and is most certainly disrespectful. And as it suggests here, "The Horns" is not just commentary on the sad state of someone's marriage, or the lack of faithfulness in a wandering spouse. It can also be shown in a way that indicates the giver is attempting to ward off suspected evils in a targeted individual, or give them a curse. This from a Wikipedia piece titled "Sign of the horns" (link). Its earliest use can be seen in India, as a gesture very commonly used by Gautama Buddha as Karana Mudra which is synonymous with expulsion of demons and removal of obstacles like sickness or negative thoughts. The same usage can be seen in Italy and Mediterranean culture as well where, when confronted with unfortunate events, or simply when these events are mentioned, the sign of the horns may be given to ward off bad luck. It is also used traditionally to counter or ward off the "evil eye" (malocchio). With fingers down, it is a common apotropaic gesture, by which superstitious people seek protection in unlucky situations (It is a more Mediterranean equivalent of knocking on wood). Thus, for example, the President of the Italian Republic, Giovanni Leone, shocked the country when, while in Naples during an outbreak of cholera, he shook the hands of patients with one hand while with the other behind his back he made the corna. This act was well documented by the journalists and photographers who were right behind him, a fact that had escaped President Leone's mind in that moment. In Peru one says contra (against). In the Dominican Republic the expression is zafa, said against curses known as fukú. All of these gestures are meant to conjure supernatural protection. If this is actually the case here, we can only surmise what manner of evil Mayor Harabedian was attempting to ward off at our 4th of July parade. So we won't. All of that said, it must also be noted here that sign language for "I love you" is also "the horns." How this can be I am not sure. It does seem to fly in the face of ancient traditions. Maybe the intent in this instance is ironic? It certainly does seem to be quite an appropriation. The Tattler will follow up on this important story if and when more information becomes available to us. seems like they could flush into that tanker truck the FD has and use that to water some city owned grass, but high paid civil servants seldom do anything that makes sense! I would be happy to connect to the hydrant by my house and water my dead lawn. Why doesn't the city announce when they are going to flush the pipes so people with gardens can come by and capture the water? Ah c'mon, the pic is just mid-wave and this mayor would not alienate anybody intentionally. He's planning to move up in the political world. Odd picture for Henderson to put on the front page of a her paper a couple weeks ago. Maybe he hasn't been enough of a kiss up to her - but that's not likely, is it? Oh, come on, he is just celebrating the Texas Longhorns. Which, of course could mean I love you Texas U. The horns caused the drought.